Travels in my backyard: The Body Remembers, But Does the Self Know What to Do Next? The Body Remembers, But Does the Self Know What to Do Next? Hm. I feel I have something stuck in my throat. Today’s writing prompts were a Facebook post with the above quote from Bessel A. van der Kolk about how awareness of what’s going on in the body is a tool for healing trauma in our pasts, and a Dear Sugar radio episode featuring a query from a wounded mother of a young child. So I check in with my body. Three things call to me right now. OK, four. I’ll start at the top with a headache. I woke up with an achy head that is just now beginning to feel a little less like a sack of concrete I am carrying on top of my forehead. Oh, who am I kidding? Not me, apparently, as I notice that the pain has settled into my left sinus. Then there’s this hinky jaw-to-clavicle thing. It’s making me feel halting and restricted. My right palm (on my space-bar hand) complains, deep in the pad at the junction of my thumb and its hand. And I have a knee injury (official diagnosis: IT band syndrome) I am just starting to rehabilitate. So not only do I feel a bit unsteady on my pins, but I’m also experiencing pain in the areas associated with talking and writing and thinking. That assessment makes me check, and feel again: Where am I not feeling pain? My heart feels good, warm, safe, and surrounded by loving beings, including me (a slightly fearful being of late but deeply loving, and lovable). My bum feels fine, thank you very much. My feet feel solid on the floor. My strong thighs feel like camshafts, ready and able to execute my brain engine's directives. My ankles are happy and my back feels neutral and relaxed. My waist curves in at one of my body’s crucial boundaries, a spot I feel protective of and pleased with all at once. Cheryl Strayed and Steve Almond's discussion of the unmothered mother's letter and conversation with her Portland writer friend Renee was another great reminder that so many of us have experienced terrible interruptions in our care and betrayals of our innocence. When I talk to my teenager these days, I sometimes say, "Don't do something you'll regret, especially if it's something you can't undo." I feel some things were done to me that can't be undone, but somehow being able to say this is again freeing and releasing. Because I said it, again, and will you look at that! The Universe didn't throw any lightning bolts at me, nor turn me into a pillar of salt. But now what do I do with it all? “What’s next?” as van der Kolk asks in his book. Do I go back to bed and try to sleep off the headache? Do I push through the headache into the list of chores for the day (make another coffee, eat, cook, gather gear for the weekend, and clean)? Do I go to my dance class in an hour and try not jumping and traveling — just exercising my upper body? My first instinct is to write, so here I am. But (true confession) between when I started this piece and now, I had a cleaning impulse, so I hung and reorganized a few things in my closet. I’m starting to think I don’t need as many things as I used to think I needed, which is a relief and a burden, the latter because the process of getting rid of things is an effort. It is many efforts over time. Then I pulled a hanger out of the handful I was relocating in my closet and saw that I had assembled a beautiful and complete outfit that I hardly ever wear. For me the answer is seldom simple. Yes I feel joy because of the colors of the fabrics and the other materials, and because of the completeness and elegance of the outfit. I remember finding the dress while shopping on Berkeley's 4th Street at a clothing outlet in a happy moment of freedom and independence. 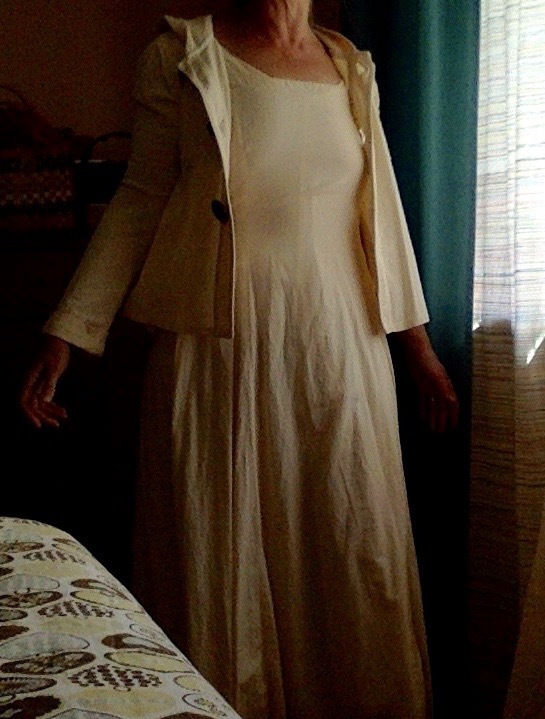 When I feel something other than joy it is because of the way the items fit me (the slip isn’t all that comfortable, and the jacket is just a little too short for my torso). But I learned something from this outfit. The fact that it was 20 years between when I bought the dress and found a slip for under it and a jacket for over it told me I should avoid buying anything I can't wear as is. Clothing that requires more clothing is seldom smart and results in garments that occupy space in my closet for years, unworn, while I say, "Hmm, I wish I didn't have to wear tights and a camisole under that." Then I thought: What if I put together outfits and sold those? I guess that is what those glossy fashion magazine stylists do. I can understand why that is a coveted and rare job, but so many of us are good at combining what we have and assembling something more beautiful than the apparent sum of its individual elements. More than just Vogue employees are doing this every day. I suppose this is what we do when we write, too. We make meaning out of a bunch of individual symbols (“signifiers,” we called them in lit-crit school). And it is what we do when we live. We take the animal shell we are given and fill it with ourselves, and then we use the whole animal-and-self being to love, play, learn, work, give, show -- all those things that make our lives and maybe even others' lives more meaningful or more loving or more delicious or more beautiful. So it is now time to feed this body some food, drink more water, and make a coffee with coconut oil in it. I don’t want to do too much but I don’t want to do too little, either. I am going to hang a few things up, pack a few things, and cook a couple of delicious things for later. I will do my exercises and contemplate what healing looks like, and feels like. “More to be revealed,” as my mother loves to say. “More soon,” I always concur. "We take the animal shell we are given and fill it with ourselves, and then we use the whole animal-and-self being to love, play, learn, work, give, show -- all those things that make our lives and maybe even others' lives more meaningful or more loving or more delicious or more beautiful."